If the horror genre were a person, you’d probably find their sense of humour smug and self-serving. Yes, when horror films include jokes, they’re usually one of two things. Either we get faux-B-movies where the central joke is the fact that the film itself even exists, such as Snakes on a Plane, Machete, or FrightFest’s Zombeavers. The other is jokes about the genre in general, as with the postmodern masterpiece Scream, and the next five years of tedious “self-aware” slashers that followed. The problem with these sorts of jokes is that they’re not nearly as clever as they seem to pride themselves on being; the films seem to say “Ha ha, aren’t I stupid?”, and I tend to just sort of think “Yeah – so?”. 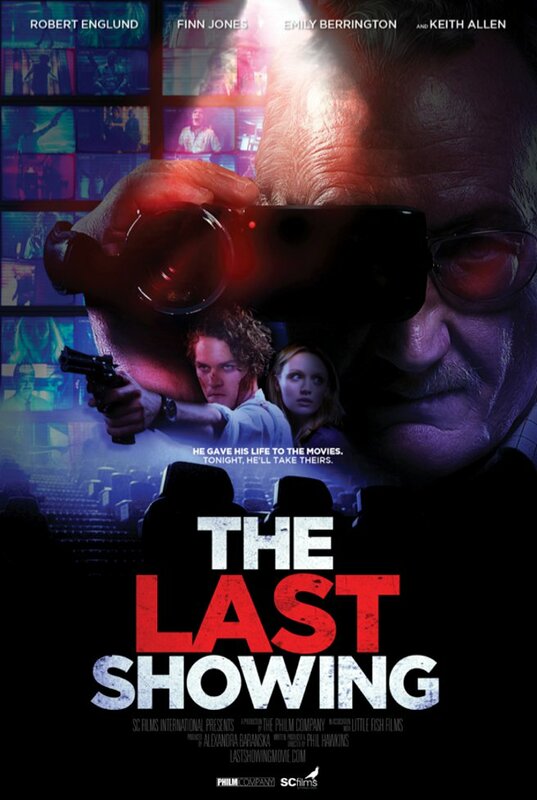 The Last Showing, luckily, avoids that tedious sort of humour. The plot outline, which sees a disgruntled cinema projectionist trap a young couple in a cinema after hours in order to make his own horror film, is rather ingenious, but at the same time, rather obvious too. Casting Robert Englund, a man probably better known even to his mum as Freddy Krueger, could also have turned the whole thing into one long wink at the audience. So, excited as I was to go the last showing of The Last Showing at FrightFest – especially with Englund himself introducing the movie – I was anxious, too. I really, really wanted to like this movie, and in the end I did. It’s obviously a film for horror fans, but in itself, it’s scarcely even a horror film. The idea of the plot being driven by a charismatic and improbably intelligent figure who controls all through cameras and messages recalls Saw, but there’s no gore in the film. There’s one brief and inventive torture scene, and that aside, it’s all psychological thriller, the rest of the way. And while there are small elements that will appease horror fans, the film should be just as accessible to non-fans. Sure, the young couple in the film are attending a screening of The Hills Have Eyes Part II – 1985, not 2006 – but if you don’t know why that matters, don’t worry, because that just puts you in the position of the boyfriend – Loras Tyrell on Game of Thrones – and the girlfriend – that fit posh girl from The Inbetweeners 2 – will explain it to you. Mind you, despite the girlfriend being a big horror nerd who specifically name-drops A Nightmare on Elm Street in a discussion on Wes Craven, she never clocks how Robert Englundy the projectionist looks. Maybe in this universe Freddy Krueger was always played by Jackie Earl Haley. I kind of wish the subject had come up in the film. The projectionist character is very chatty about horror films and film in general, and he’s probably the best thing in the whole movie, even when he doesn’t get things quite right – like saying that Bruce Lee died shooting Enter the Dragon, when it was actually Game of Death. He’s charismatic, witty, and actually pretty likable. Like most horror villains, he’s secretly the hero, and you really want to see him succeed against the fairly annoying kids he’s terrorising. But unlike Jigsaw, Pinhead or good old Freddy Krueger, he’s actually a pretty pathetic figure, too. He’s losing his job, since film is all digital now; he’s disappointed with the direction of modern horror, but knows he’s ultimately powerless; and the scale of his ambition is no greater than the Cheshire Oaks Vue. It may well be that our villain’s humbleness makes him relatable – who in customer service hasn’t dreamed of torturing their customers? – but it certainly helps that we’ve an intelligent script; direction which makes the most of its clearly very low budget; and a central performance by a true great of the horror genre. For me, The Last Showing was the highlight of this year’s FrightFest. Many thanks to Chris for this review and for all of his FirghtFest coverage. Make sure you look him up on Mediocre Batman here and on twitter here! Great to hear that this one turned out pretty solid. It’s always nice to see Englund pop up in the genre. It was great seeing him in person, too – a class act. I have to say, if you live in the UK & are a horror fan, FrightFest is well worth it. ← Mermaid Down has Reached it’s Funding Goal!